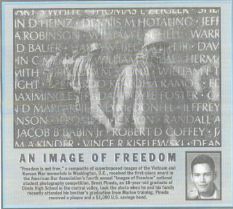 "Freedom is not free," a composite of superimposed images of the Vietnam and Korean War memorials in Washington, D.C., received the first-place award in the American Bar Association's fourth annual "Images of Freedom" national student photography competition. Brent Pineda, an 18-year-old graduate of Clovis High School in the central valley, took the photo when he and his family recently attended his brother's graduation from Marine training. Pineda received a plaque and a $1,000 U.S. savings bond. Attempting to focus its efforts on policy-making, the State Bar Board of Governors has begun to consider issues it believes may result in fundamental changes to the legal profession, most particularly multidisciplinary and multijurisdictional practices, challenges to core values and access to justice. At a special meeting called recently solely to address policy issues, the board also looked at the unauthorized practice of law which sometimes can result from new types of practice, and at ethical challenges presented by the internet. Changes in the profession are being driven by forces including technology, market specialization, price competition, client sophistication and the globalization of financial service markets. Coupled with the high cost of services and reduced access to justice for the average Joe, the legal profession is undergoing a kind of deconstruction, says David Long, a policy analyst for the State Bar. What were seeing is the slicing and dicing of legal services, he said. As a result, new legal delivery systems are emerging. In addition to multidisciplinary offices which offer one-stop shopping, consumers increasingly may choose hotlines, internet advice, self-help books or nonlawyer advocates to solve a legal problem or they may represent themselves. While new systems offer new opportunities for practitioners and consumers, they also present challenges and potential ethical pitfalls. California Bar Journal takes a look at some of the changes facing lawyers and their practices. A site touting the benefits of paralegals explains that attorneys use them to prepare legal documents. Why hire an attorney when you need a paralegal? the page asks. After two years of discussion and debate on the vexing question of multidisciplinary practices for attorneys, the American Bar Associations governing body last month soundly rejected the idea of permitting lawyers to partner and share fees with non-legal professionals. The vote amounted to a rejection of a special ABA committee which had recommended that ethics rules be amended to permit MDPs in which lawyers have sufficient control and authority necessary to assure lawyer independence. Although the committees proposal sought to preserve the legal professions core values, the resolution ultimately adopted said each state should retain and enforce rules that generally bar the practice of law by entities other than law firms. The resolution emphasizes the importance of the legal professions core values of independence of professional judgment, protection of confidential client information, loyalty to the client and avoidance of conflicts of interest. When the California Supreme Court ruled two years ago that lawyers can represent clients in California only if they are licensed in this state, it rang a national alarm. A longtime requirement that out-of-state lawyers can practice here only if theyve passed the California bar examination  quietly ignored by many  suddenly took on new meaning.